Westcliff University proudly supports America’s veterans and active duty military personnel. We are committed to serving you with the same integrity with which you served your country. Our goal is to provide you with the education you need to help you to pursue and achieve the success you deserve. Below is a summary of the veteran’s education benefits that are currently available to eligible service members. Westcliff University does not participate in the Yellow Ribbon program. Questions about your enrollment certifications may be directed to the campus Financial Aid Office. Questions regarding your specific eligibility for education benefits should be directed to your VA Regional Office. 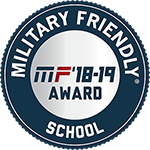 This program is for student-veterans who have served at least 90 aggregate days on active duty beginning on or after Sept. 11, 2001, or who were honorably discharged from active duty due to a service-related disability after serving 30 continuous days beginning on or after Sept. 11, 2001. Active duty time will determine tuition percentage benefit eligibility that expires 15 years after separation. Additional benefits include tuition and fee payment to school of choice and a book stipend of up to $1,000 per year. VA pays school directly. Under Chapter 30, active-duty members enroll and pay $100 per month for 12 months. They are then entitled to receive a monthly education benefit once they have completed a minimum service obligation. Eligible veterans have 10 years after leaving the military to use this benefit. Student pays tuition. A reservist solider must be actively training and have a six-year obligation in the reserve unit to be eligible for this program. This benefit is based on the student’s enrolled credit status, meaning full time, part time, or less have prorated amounts paid out to the soldier’s direct deposit. Student pays tuition. For a reservist activated for more than 90 days after Sept. 11, 2001, the monthly benefit will reflect the length of title 10 orders. This benefit is based on the student’s enrolled credit status, meaning full time, part time, or less have prorated amounts paid out to the soldier’s direct deposit. Student pays tuition. Dependents educational assistance provides education and training opportunities to eligible dependents of certain veterans. Review education benefits information and application on our website: www.tri-c.edu/gi-bill. VA pays school directly. Veterans with a service-related disability rating of at least 20 percent are eligible. VA pays costs such as tuition and fees, books, supplies and equipment. VA will also pay a monthly benefit to help with living expenses. VA pays school directly.